As English professor Jack Dudley, Ph.D., delves into a lecture at the Mount's Frederick campus on horror films that pay homage to Edgar Allen Poe's works, students from St. John's Catholic Prep, who fill the classroom, engage in discussion with Dudley and with students from St. Maria Goretti High School in Hagerstown, who participate in the class remotely using Zoom hybrid classroom capabilities. 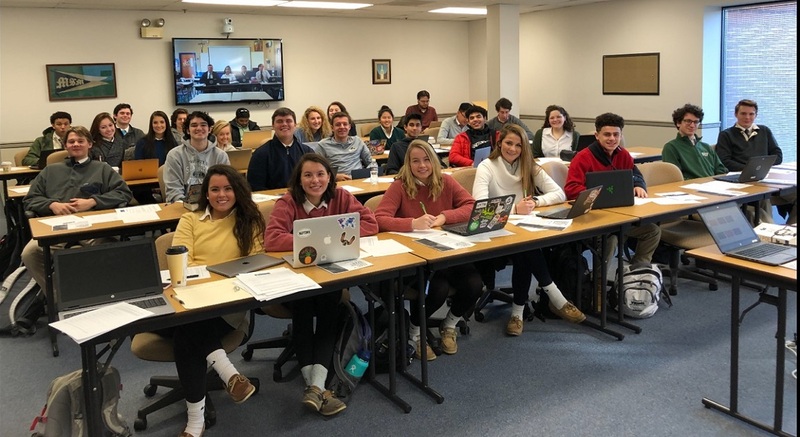 Technology in the higher education classroom now aids high school students in accessing college courses, as illustrated by the American Horror Story English class at the Mount's Frederick campus. While St. John's Catholic Prep is near the campus and students even have time to change into their uniforms before heading to school for the remainder of their day, the Goretti students' commuting time would make it nearly impossible for them to take the class if they couldn't participate virtually. Dudley's class, being offered this semester, studies American horror fiction and film, focusing on authors such as Stephen King and Edgar Allen Poe, as well as the philosophical and cultural implications of their works. This course, as well as sociology and criminal justice classes the Mount has offered to high school students since 2017, count both as college credit and as a requirement toward high school graduation.